This. Is. Insane. Really; my mind=boggled. I want to know who owns this embarrassment of riches so that I can 1)curse them for making my not-insignificant library look puny and pathetic 2)become bosom friends with them so that I can rudely gawk at and dig through their collection. On an inquisitive note - does the ladder not seem woefully inadequate? Thanks to Anatomy of the Self for this incredible find. 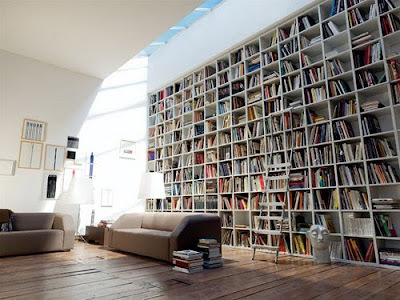 One of my favorite dreams is to have a bigger library. I love these shelves!! !